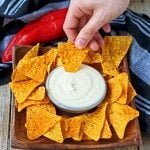 I came up with this new Vegan Cheese Sauce recipe when I simply needed something to dip in. This easy recipe contains only 3 ingredients and it is a incredibly delicious: cheesy, creamy, rich, delicious, mouthwatering, satisfying – I never expect this Vegan Cheese Sauce to come out like this. This recipe will be a basic staple in your house not only because it’s delicious. It’s a time saver as well. You only need to soak the cashews for 15 minutes and then switch on the blender to get this quick Vegan Cheese Sauce to blow you away. At first sight, this is a basic easy recipe, but I guarantee this is not a boring or bland creation. You can enjoy the Vegan Cheese Sauce. 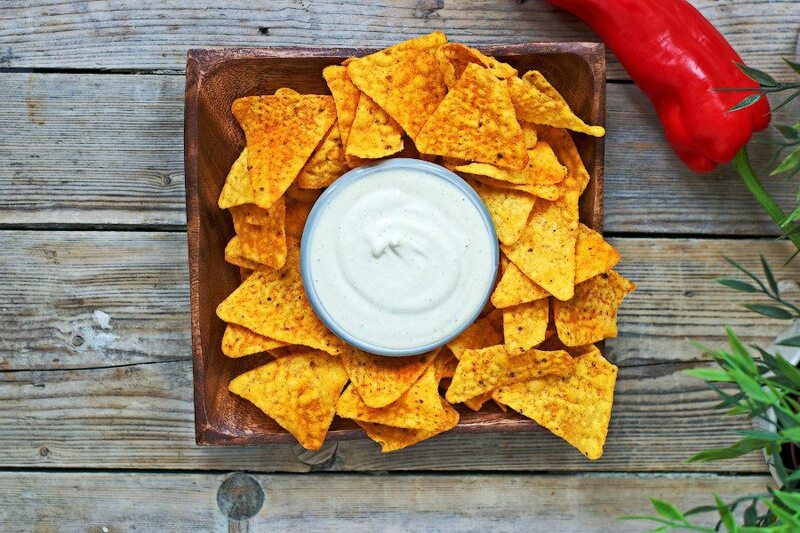 Not only as dip for nachos or vegetable sticks – as I did – you can also use it as pasta sauce, in casseroles, sandwiches, wraps. Infinite possibilities. This Vegan Cheese Sauce recipe is made with only 3 natural ingredients, no preservatives or other gimmicks. Simply 3 absolutely approachable ingredients which all of you guys mostly have in your pantry. No need for extra grocery shopping! All you have to do after 15 minutes of soaking the cashews is to drain them and put them into a blender with 1 1/4 cups vegetable broth and 1 Tbs tahini. This combination is right for me. If you like the taste stronger, just play around a bit with the ingredients. 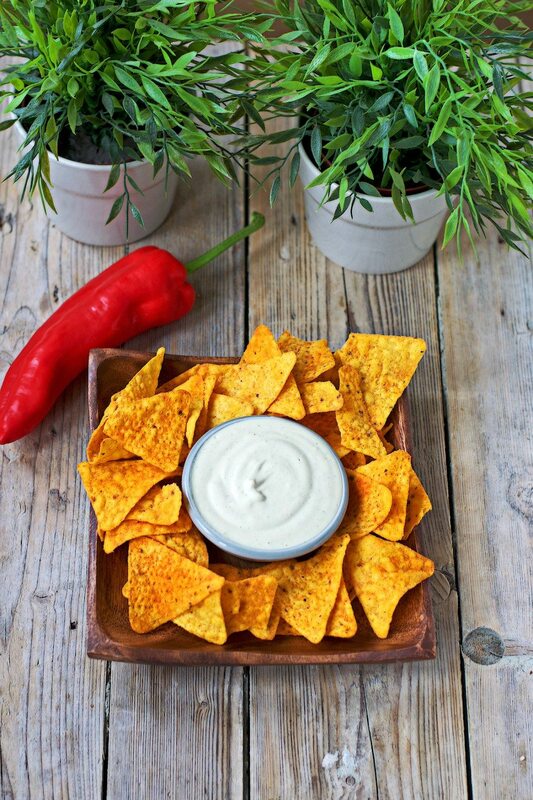 With this Vegan Cheese Sauce there is no end to your creativity. I know all of you guys are addicted to Mac & Cheese and you can whip it up in minutes with this sauce recipe. This oil free recipe includes just a little tahini paste (1 Tbs) and the cashews so there is no extra need and use for oil. Good for all of you who need or want to watch your oil intake. The third ingredient, the vegetable broth, is completely fat free and adds flavor to this vegan cheese sauce recipe. I think this recipe will impress all your guests of you bringing this fast recipe to a party table with some veggie sticks, or vegan crackers, or tortilla chips. No one will guess that it is made with only 3 ingredients and there is no nutritional yeast or cheese substitutes in here. I think even meat lovers will adore the cheesy taste so this one will be a good start to include more veggies in your nutrition. This dip perfectly pairs to cucumber, carrot or bell pepper sticks as well. You should definitely give it a try to know how incredibly easy and wonderful a all natural vegan cheese sauce recipe tastes. I’m really excited to hear your feedback and thoughts about my Vegan Cheese Sauce. Just tag me on Facebook and Instagram, snap a picture and let’s meet over there. See you soon and enjoy, Florian. 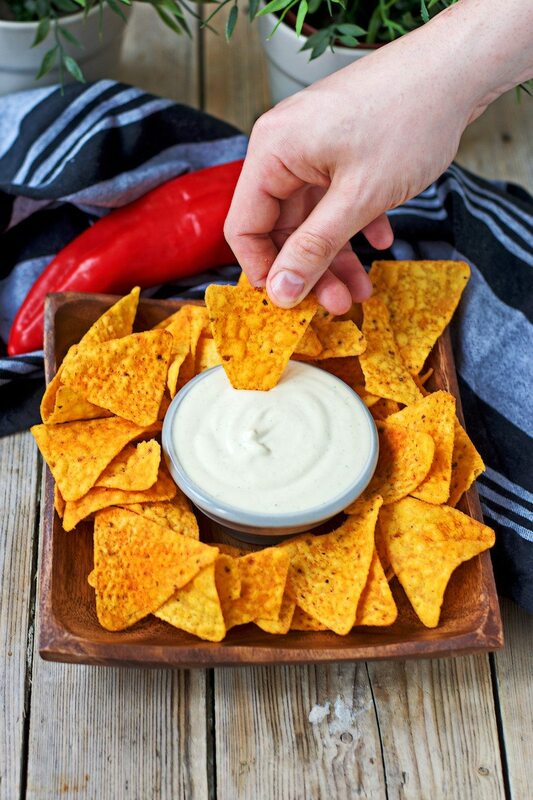 I came up with this new Vegan Cheese Sauce recipe when I simply needed something to dip in. This easy recipe contains only 3 ingredients and it is a incredibly delicious: cheeesy, creamy, rich, delicious, mouthwatering, satisfying – I never expected this Vegan Cheese Sauce to come out like this. After soaking the cashews in hot water for 15 minutes, drain them and transfer to a blender. Add vegetable broth and tahini. Process until smooth. I just love the cheezyness of cashews! Such an essential and this is why ALL cheese should be vegan! SO beautiful and creamy Florian! I think most vegans live off cashews, what would we do without them?! I use them for my cream cheese and sauces and well, everything, haha! Love how creamy this looks and you are right, perfect for cheese! This is such a great base for new vegans who are unsure where to start on how to make their own cheese. I love to add acid and nutritional yeast and spices to really trick all my non-vegan friends that it tastes just like dairy, they truly can’t tell! Beautiful creamy dip shots!! Thank you, my friend. I love how simple it is to make your own cheese and cheese sauces from cashews. It’s simply the best. I’ve just found out that I have to avoid cashews and sesame seeds….is there another nut I could substitute for cashews and perhaps a nut butter rathervthan tahini in order to make this delicious sauce? Hi Susan! I would say try almonds and almond butter! But I would suggest add 1 Tbs nutritional yeast to make this a more cheesier taste. OMG, I just love this recipe. I’m definitely going to make this and I know everyone will just love it. I can’t wait to try this! I love have alternatives for my dairy free friends! Yum! i make something similar but i have to try your version – looks amazing! This sounds great! And so easy! I must try it soon! Love cashews, and know I would love this creamy dip! I love all the unique ways to use cashews. I need to keep this in mind for my upcoming holiday meals where I have vegan guests coming. This will please them. Wow! This is so easy. I cannot wait to try this. I sounds like a “blank canvas” for lots of flavor additions as well and just delish on it’s own. YUM! Mine turned out way runnier than I was expecting. I ended up soaking another 1/2 cup of nuts and also adding in a little seasoning. It’s a great last-minute dip, though! Thanks! Thanks for your great feedback, Jenna! Following up to say that it does thicken up after refrigeration. I ended up with more of a spread than a dip and it was pretty amazing. Made some awesome grilled spinach and cheese sandwiches! How not good would it be if I used tahini rather than the tahini paste? I gave that on hand. Hi Nikki! Tahini and tahini paste are the same! You’re a lifesaver! For once, Google sent me on the wrong direction when I googled the difference saying there was one 🙂 Fabulous! Can’t wait to make the M&C recipe. Do they need to be raw cashews? Hi Katlyn! Roasted cashews will work as well! Totally surprised! And it was so easy and quick. This is the first recipe I made for vegan cheese and I am thrilled that I have such an easy recipe for the future. I think I need to blend it longer to make it smoother but actually once it was added to my dish I couldn’t tell it wasn’t as smooth as I wished. I sautéed some broccoli and onions and added the vegan cheese for a cheesy broccoli dish – no rice but will try rice another time. Yum!!! Thank you! It’s a game changer since it’s so delicious and so easy. Thanks for your amazing feedback and sharing, Laura! One of my all-time favorites, yum! Real good stuff😋 mixed it with gf spaghetti and roasted cherry tomatos and onion YUM!! Can it also be made with brazil nuts? Thanks a bunch for your amazing feedback and making it, Bianca! That sounds delicious, yum! I guess it will work with brazil nuts as well, but I would use less nuts. Let me know how it goes.